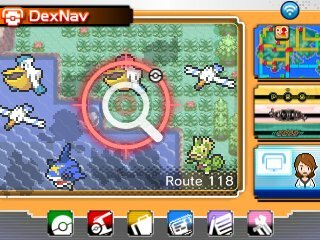 The DexNav is a brand new feature that appears on first sights to be a derivation of both the PokéRadar and the shaking spots that exist in Pokémon X & Y. Using this feature of the PokéNav Plus, you have the ability to hunt for various Pokémon. When this occurs, the Dex Nav will activate and when activated, it will show you the Pokémon that you are finding, and more. 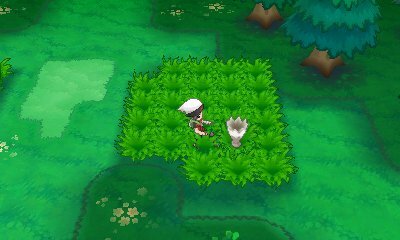 In addition to this, if you approach a Pokémon in the overworld, you'll have the ability to scan them using the DexNav, which adds them to your Pokédex. When you capture Pokémon, however, they appear fully on this. If you tap them on the interface, you have the ability to check their Pokédex entry, or to search for them. If you search for them and it finds them, then they will appear in a spot. To top that off, if you're hunting for a Pokémon normally found by fishing, it will appear in the water among the possible Surf Pokémon, which is very handy. As you collect Pokémon, you may notice a crown of Bronze, Silver,Gold and Platinum. These crowns are used to indicate if you have obtained all of the Pokémon through each of the methods: Walking, Surfing, Fishing and DexNav exclusive. The more you capture, the better the crown. Ability: You will see the Pokémon's ability. 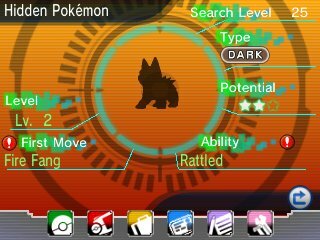 For the higher level on DexNav, you will start get a chance to find its Hidden Ability. First Move: You will see the Pokémon's first move. This is either it's normal move, or an Egg Move. 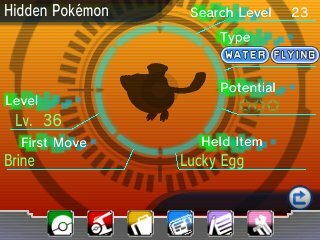 As the DexNav level increases, you will start seeing more Egg Moves known by the Pokémon. 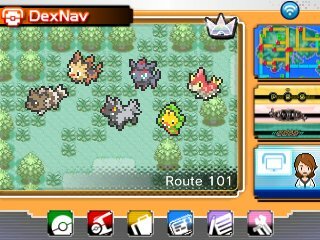 A lesser known feature of the DexNav is the ability to chain. When you get a hit and encounter a Pokémon, if you capture or defeat it, then immediately afterwards you will be able to search for it again and you are almost guaranteed to find one. If you do this repeatedly, then the chances of getting hold items, hidden abilities, egg moves and higher IVs is increased. The specifics on how much these are increased by is being calculated. After you have encountered it 5 times, then the base level increases by 1 so Pokémon that would appear at Level 35 now appear at Level 36. This happens every 5 Pokémon in your chain. This continues on until they're up to 20 levels higher than normal, 30 levels if it gets the Level boost, and then will reset to normal. As your chain increases, the Pokémon will disappear quicker, or in the case of caves and in water, they will move spot very quickly causing you to have to sneak up on them faster and thus increasing the chance of your chain breaking. If you have a different wild encounter during the chain, then it will break. If you run from the Pokémon, then the chain will break..